Studio Stuff: On a More Pleasant Note!!!!! On a More Pleasant Note!!!!! These boxes are so pretty. Pleasant indeed! These are darling Linda. 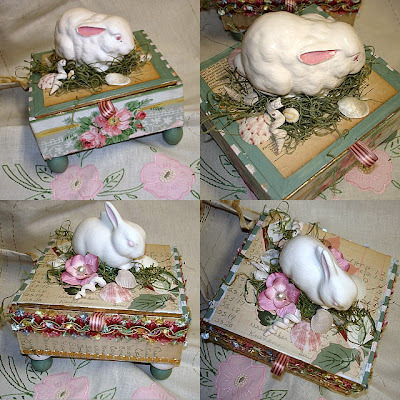 they remind me of sitting quietly in a pretty garden and being delighted by the arrival of a bunny! OH, I want spring to get her quick! The bunny boxes are superb! So sorry about your other trials. Love the boxes, they are adorable. I think I'll do a little Easter decorating this weekend. I'm so ready for SPRING!! OH MY GOODNESS_ those ares imply gorgeous! !